To access your signed in home page after you login, all you have to do is click on the "alomoves" logo in the center of the screen to be directed back to your home page, which shows your most recently practiced series and classes. You can still see the workouts you manually log on your Profile too! To find your profile, locate your personal icon in the top right corner of your computer screen. 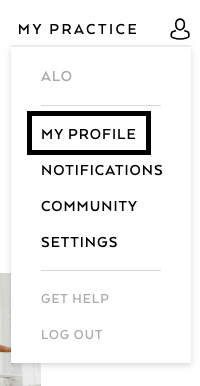 After you hover over your icon, you will see a drop down menu with your Profile listed below. When you complete a workout it will automatically be marked as complete, but you can still log individual workouts you do with Alo Moves, or freestyle by logging a workout you did on your own outside of Alo Moves to track your progress (running, swimming, weight lifting, etc...).